The average Turk is extremely patriotic, but accepting of the fact that the country is largely run by fools or the corrupt. While their savings are devalued and the country's rate of inflation soars, the average Turk hoists the red flag with the white crescent and star with pride. The average Turk is Westernised, wants the country to play a greater part in Europe, but also embraces its Islamic and Asian past and present. In short, Turkey is a place of contrasts. Straddling Europe in the west and Asia in the East, Istanbul was to be our entry point into this country that is bigger than France and Germany combined. On the way to our hotel - the first of ten that we would be staying in over a two week period - we saw children braving the traffic at crossroads and traffic lights, trying to sell roses to car drivers. It was gone midnight. The children can't have been more than 6 or 7 years old. There were no parents or other 'supervising' adults to be seen. I shuddered at this, watching these young girls fearlessly approaching cars, the thoughts of the two Soham girls who went missing (and subsequently found murdered) coming to mind. 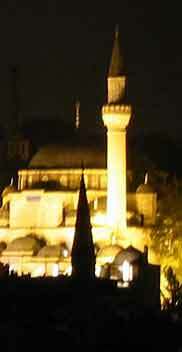 Mosque at night - the view from the hotel roof.